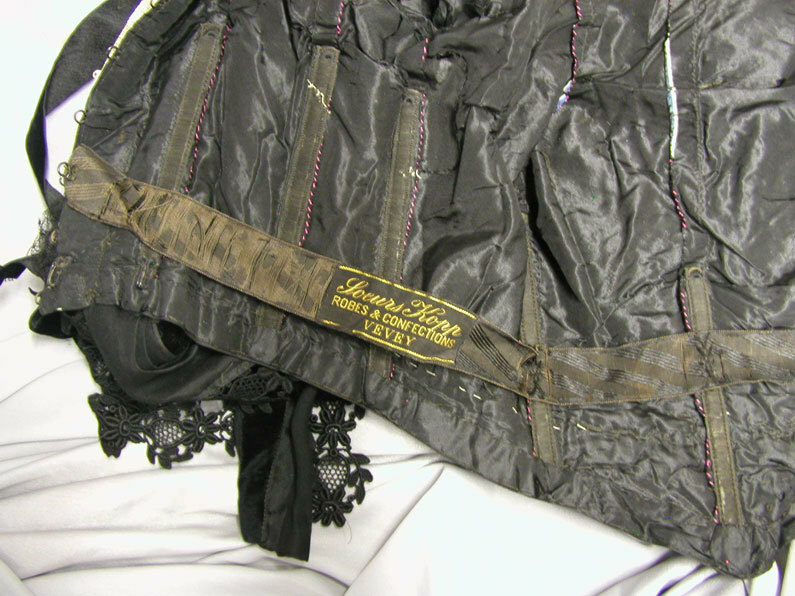 1900 French Silk Bodice Soeurs Kopp: This black silk and lace bodice was made by Soeurs Kopp, Robes & Confections Vevey. 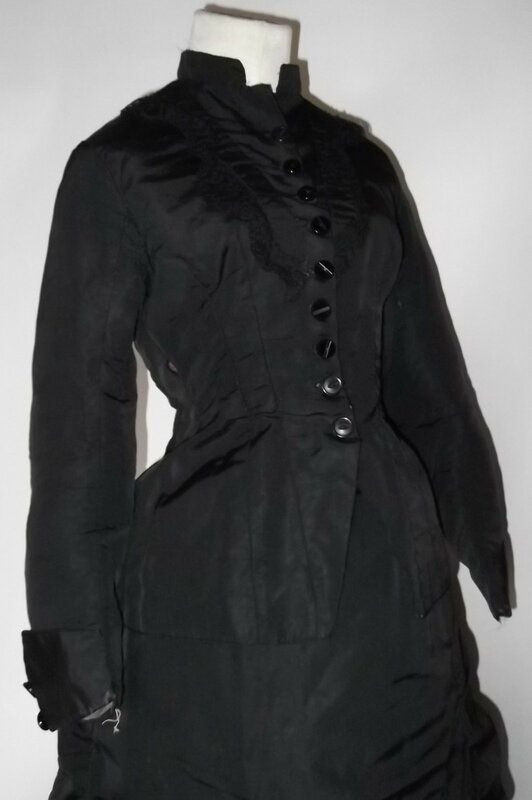 The bust is 34 and the waist is 27. 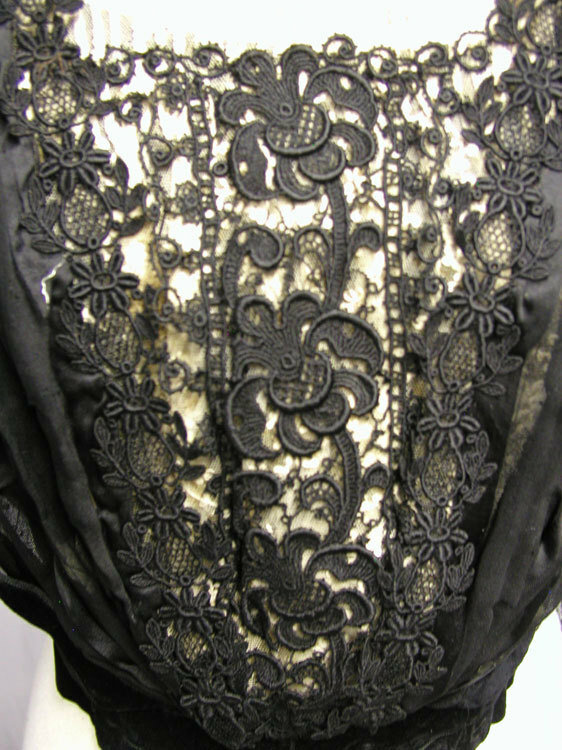 The black silk lining is in good condition but the ivory silk lining has shattered. 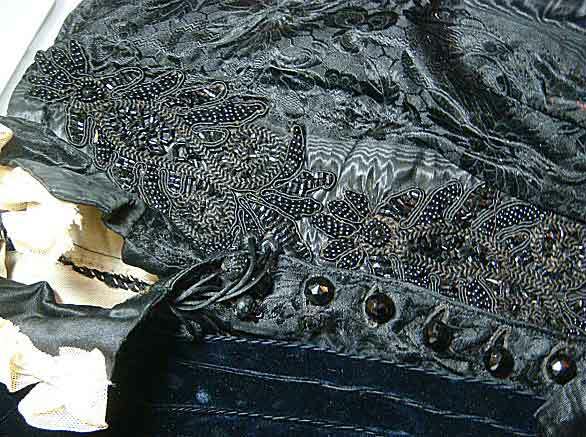 The Petersham is very worn and damaged but the label is in good condition. There is rust on the hooks and eyes and some of them are missing. 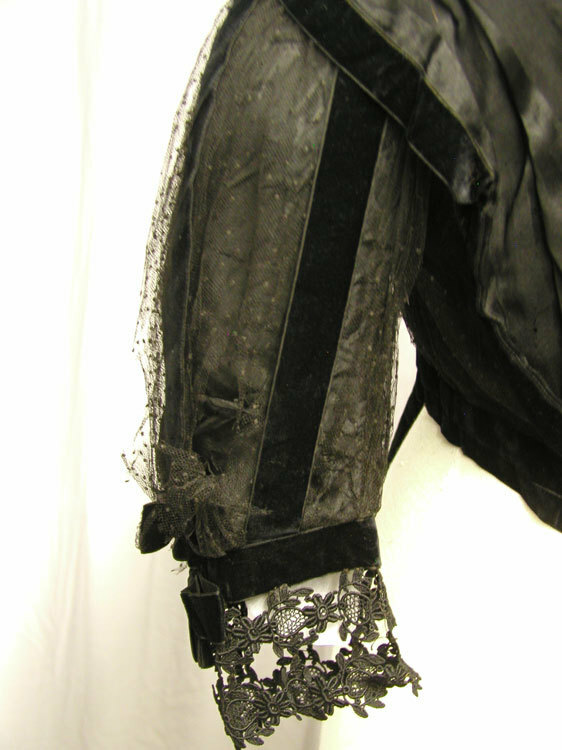 The netting on the sleeves is torn in places. (see photos). 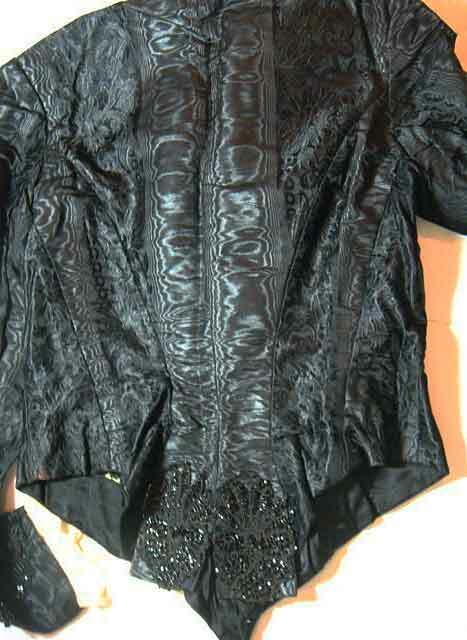 There are a few holes in the silk lining of the sleeves. 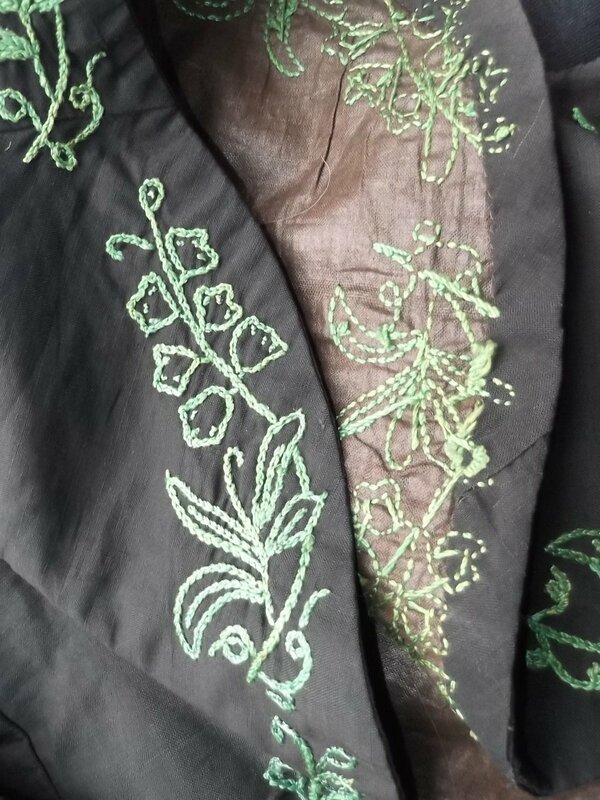 One row of the metallic braid needs to be sewn back. 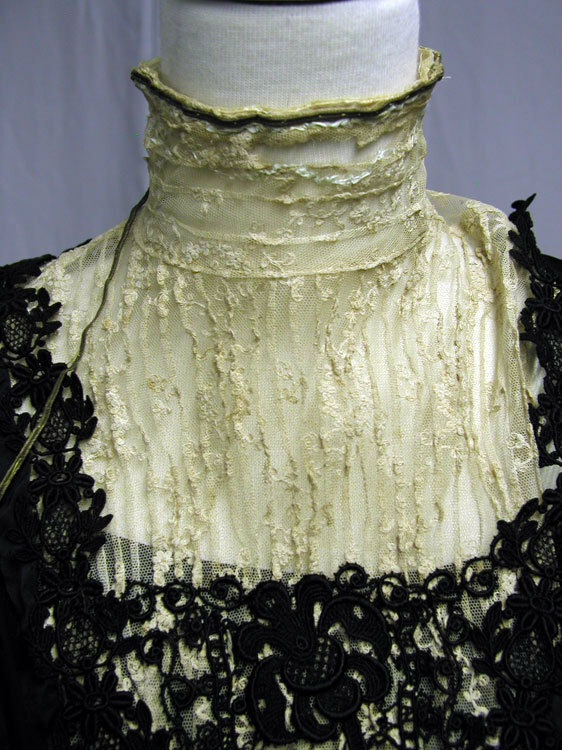 There are some small holes in the wide strip silk chiffon and the lace at the neck is torn. This piece would be great for study or design. 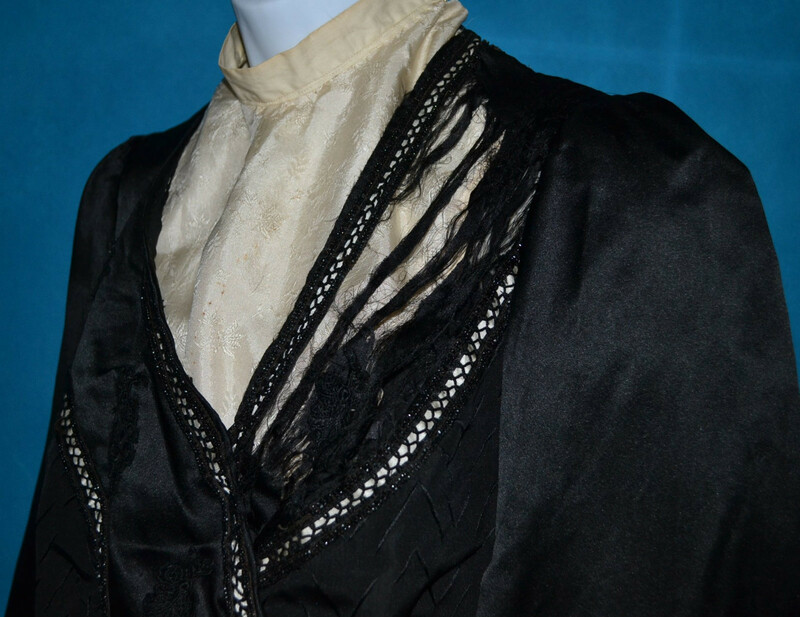 It came from a major museum de accession. I'm guessing around 1904 here. 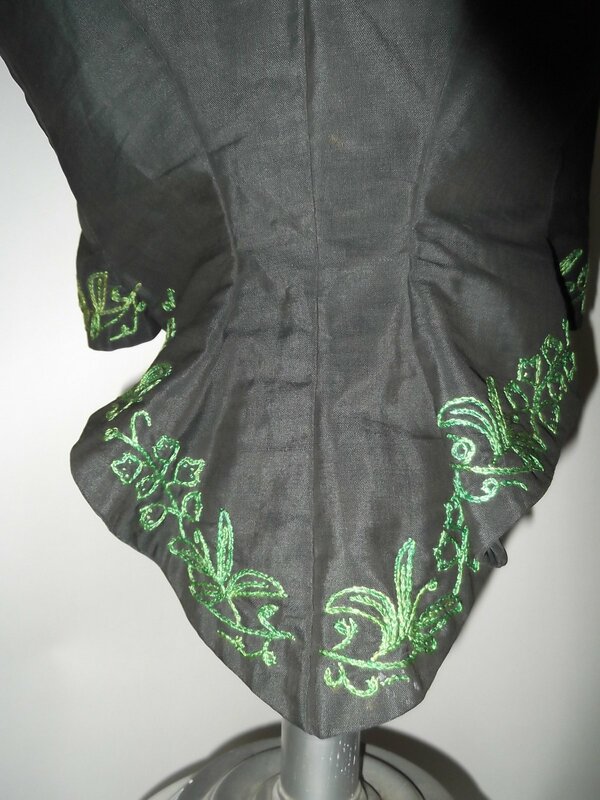 This bodice dates to the 1870’s and is fashioned of a wool and silk bengaline with an inner polished cotton lining with all of its edges richly hand embroidered in green floss in a floral and leaf pattern. 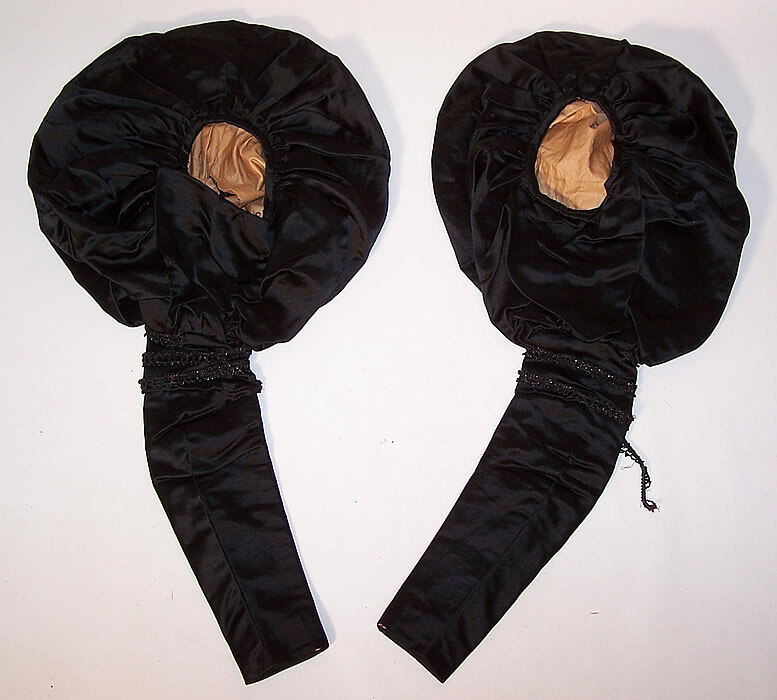 The rear tail is cut in large bustle form and there are no enclosures in the front as it is meant to be worn in open style. 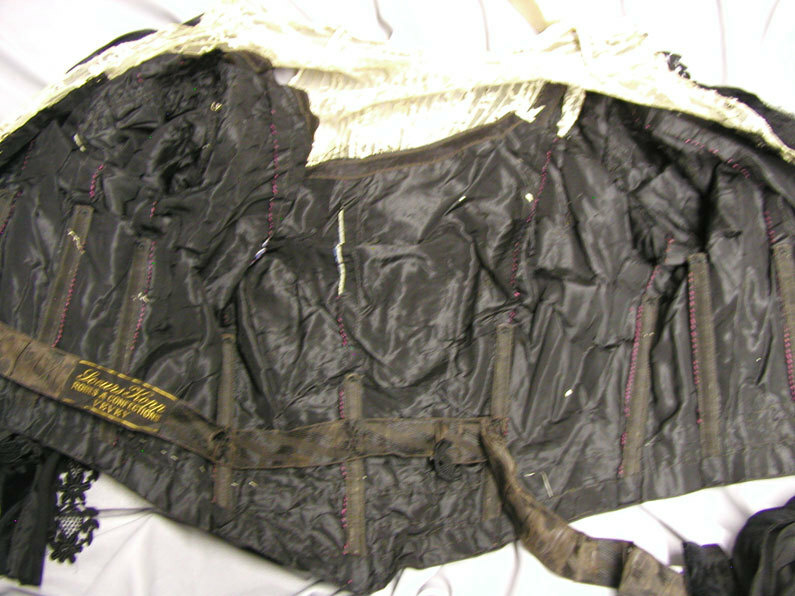 Five eraser sized holes are on the front right shoulder with an eraser sized hole on the rear beneath the neckline and one small break is seen at the left underarm. 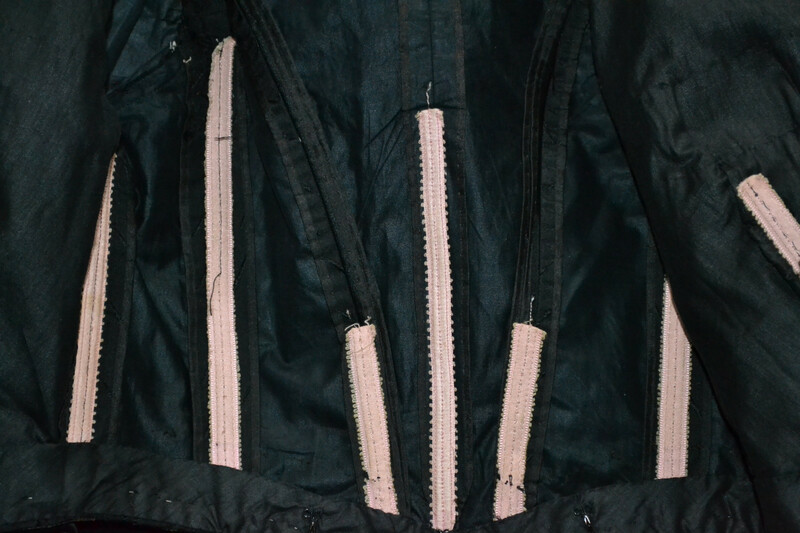 The piece is sewn by both machine and hand and is in strong wearable condition. 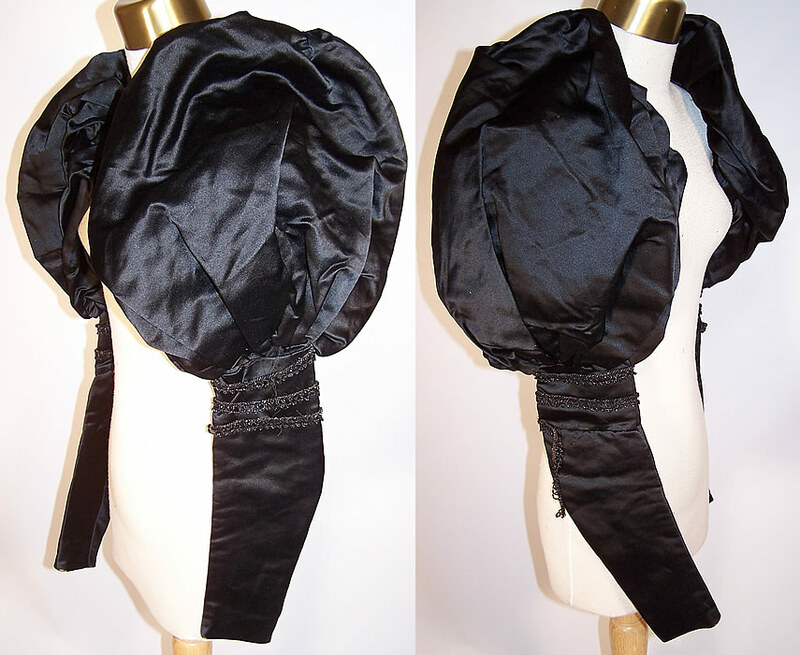 Measures 32 inches around the bust, 24 inches around the waist, and 21 inches in its rear length. Okay so this has a little bit of color but it's still rather bleak looking. 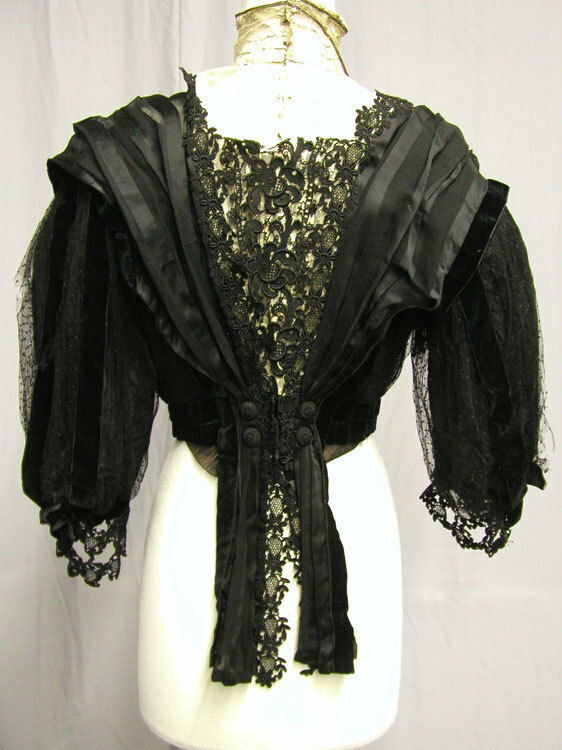 Antique Victorian Black Silk Beaded Jacket/Blouse,Restore or Use Parts............This is a beautiful jacket in spite of its age, very elegant............Measurements are approx; front,neck to bottom 19", sleeve from under arm 16 1/2", waist 13", shoulder to shoulder at back 12", back neck to bottom 20" and cuff 3 3/4".............Beading is great and in good shape. 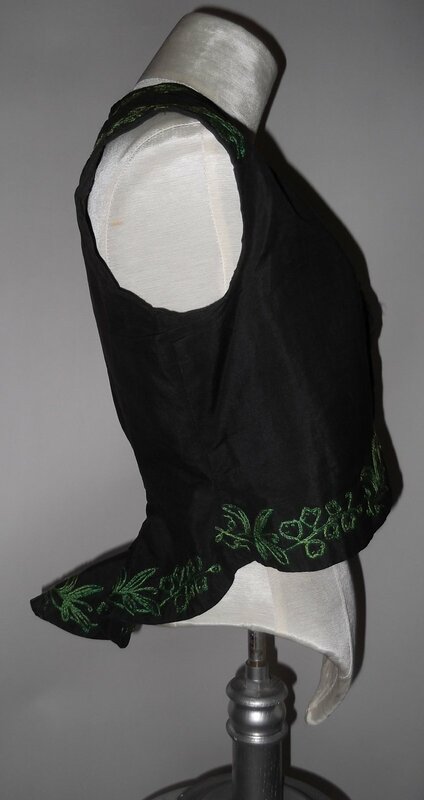 its on front left, cuffs and at bottom of back.............Am willing to combine items ending at approx the same time and if you do win more than one item, please wait for invoice with combined total. Paypal only as per ebays rules. I usually ship the next day but definately by the second day. Any questions please email me but before last day of auction. Estate Find. 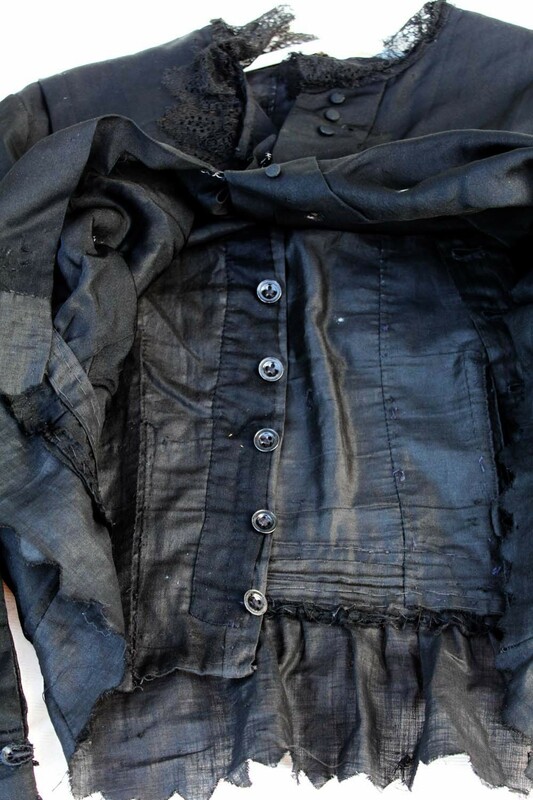 I found a half dozen pieces of what i think are victorian clothing in various states of repair & restoration. 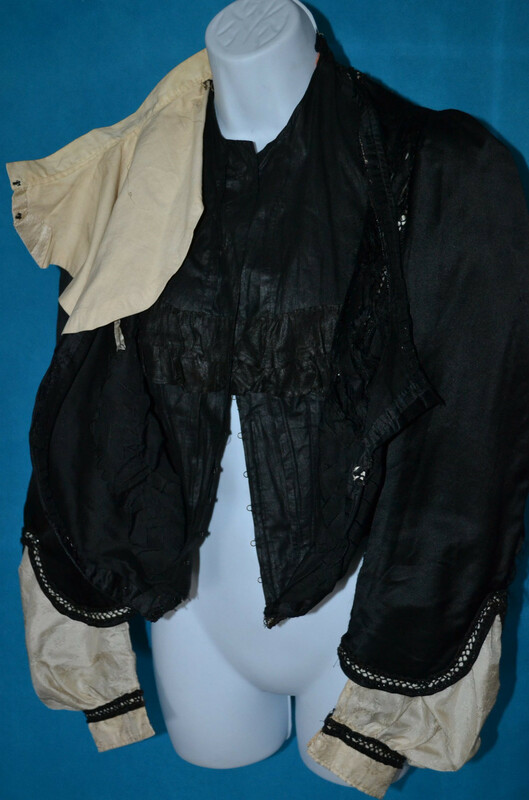 This is a skirt top/jacket/shirt. It measures 20" L with a chest of 16" flat. It's actually in good shape. For parts or resto. 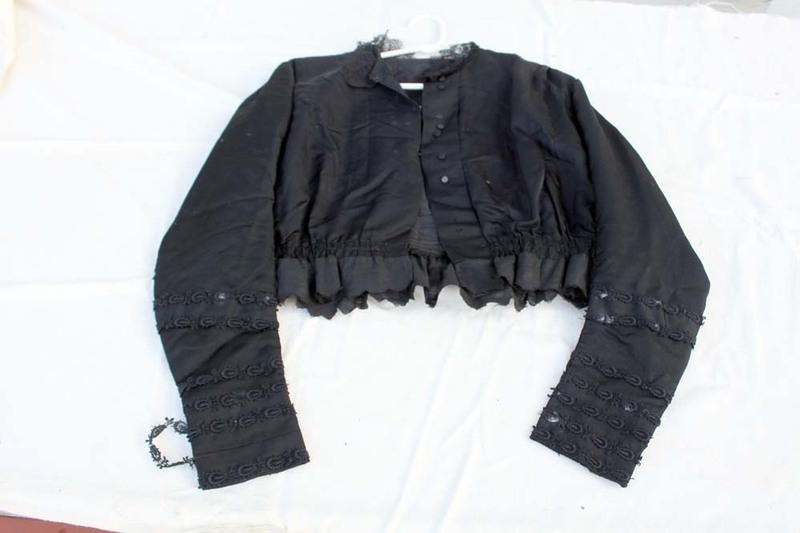 I *think* this is a late 1860's black blouse that was a part of someone's UFO stash. 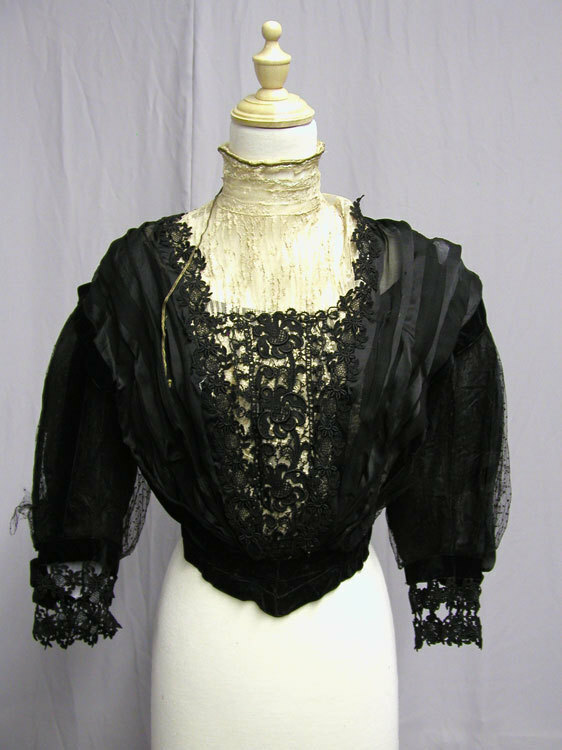 It might also be a late 1900's/early Teen Era blouse except the sleeves don't fit for that time period. Any other ideas as to the date? 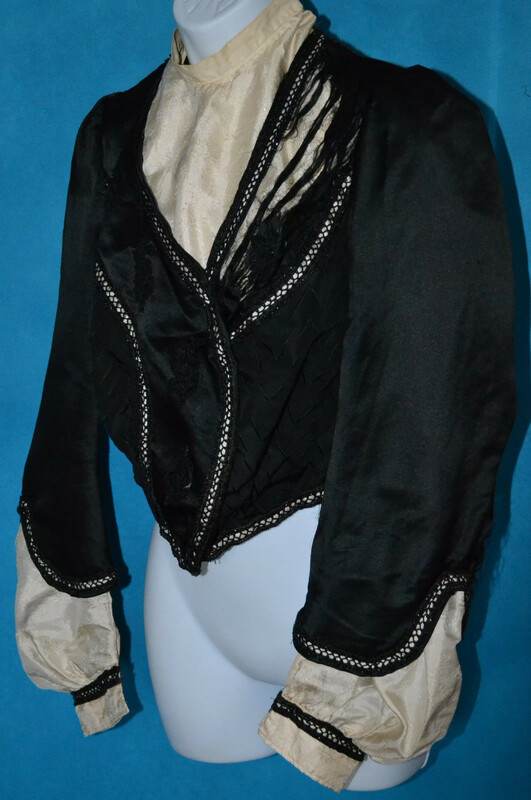 This auction is for a most exquisite antique 1800's Victorian corset jacket. 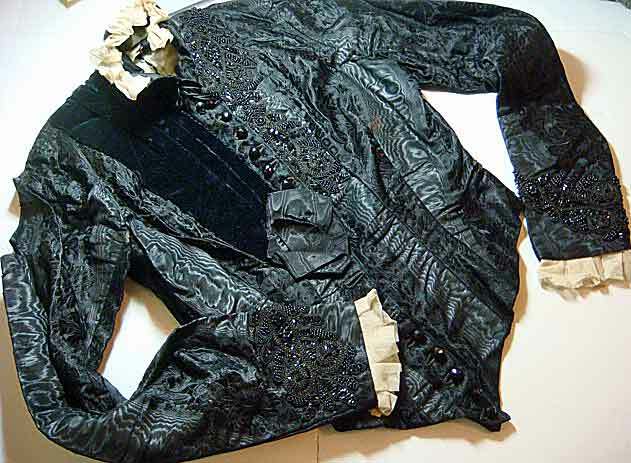 This does need some silk restoration. 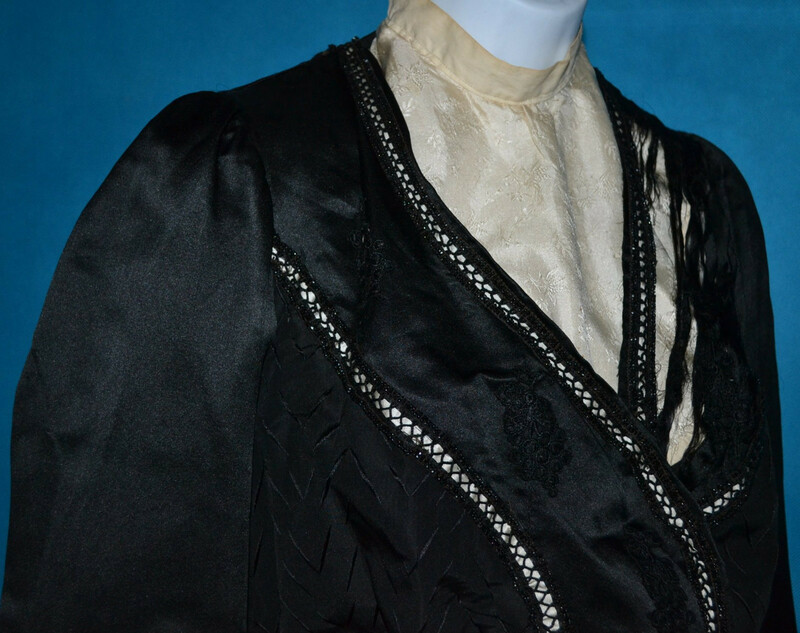 It is a beautiful jet black patterned silk fabric jacket with ivories damask silk bodice insert and hidden sleeve cuffs. 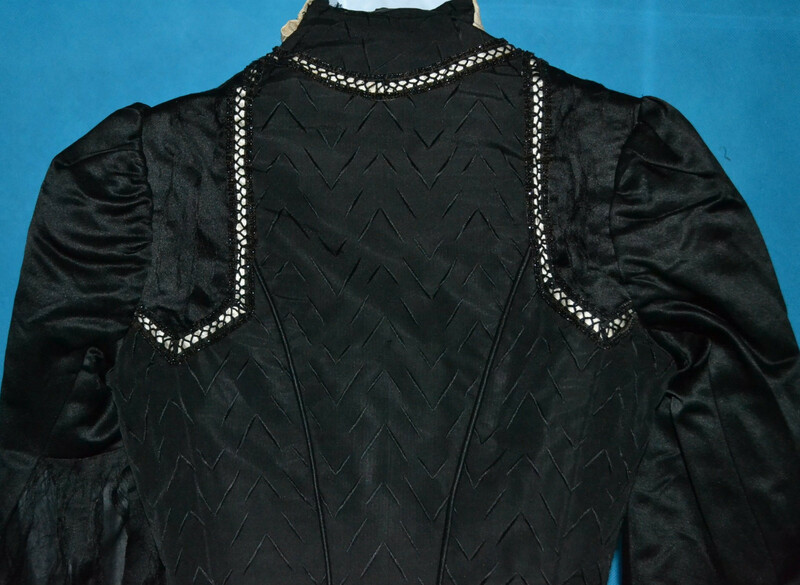 Lovely jet beaded trim decorates the jackets edges. 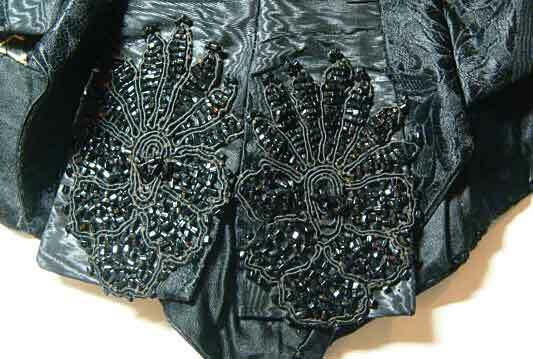 Beautiful labe appliques down the front bodice. 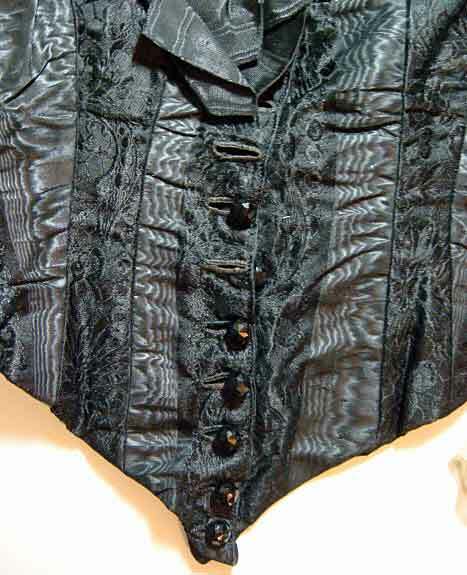 Fully lined in polished cotton with a total of 12 sewn in corset stays. 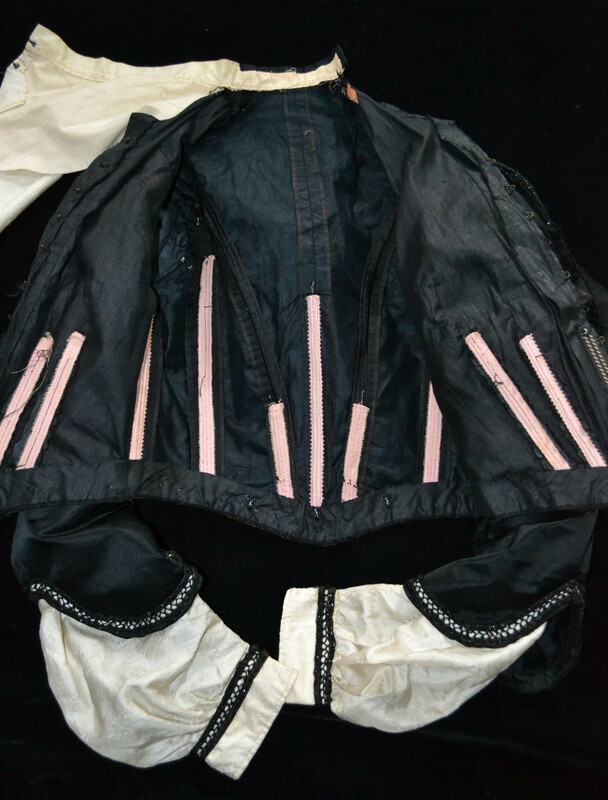 Bustle skirt supporter hooks are sewn to jacket back hemline. Early hook & eye closure up the front. 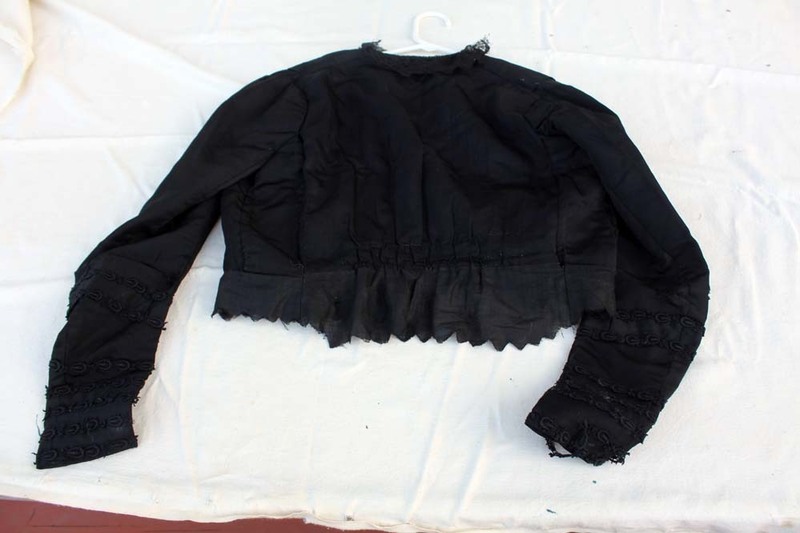 For some reason the damage occured to two areas of the plain jet black silk only....left upper bodice, left and right upper back and left back sleeve. 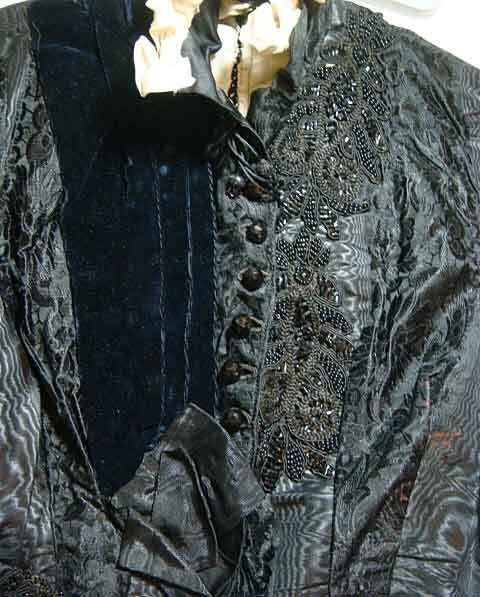 The jacket otherwise is in wonderful condition. 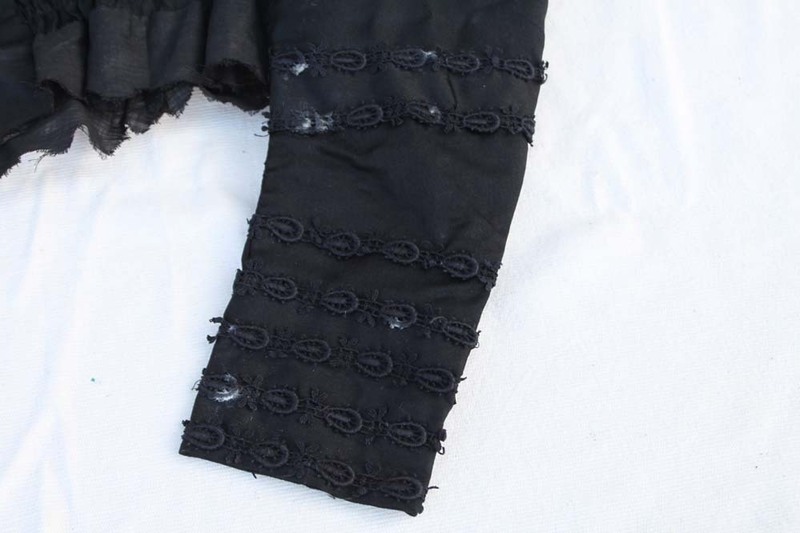 These are fabric sections that could easily be replaced if you have a good seamstress. 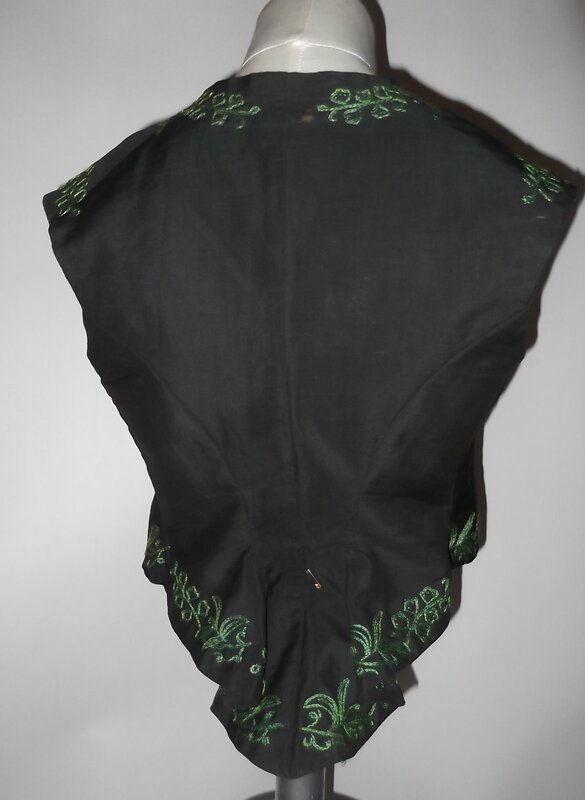 The overall patterned silk fabric is in wonderful condition...this silk is of a heavier weight. 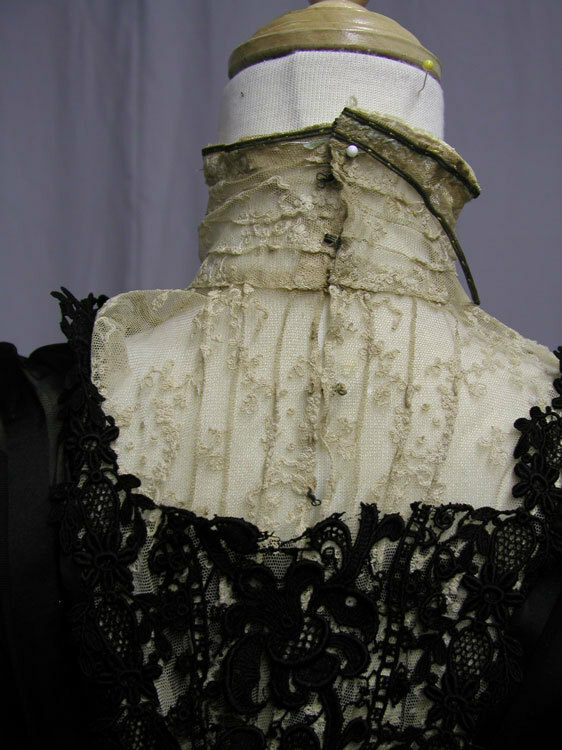 Just a fabulous antique 1800's fashion study piece of clothing which also can be worn once restored. Paypal payment is due within 3 days of the auction close. This is strictly enforced. 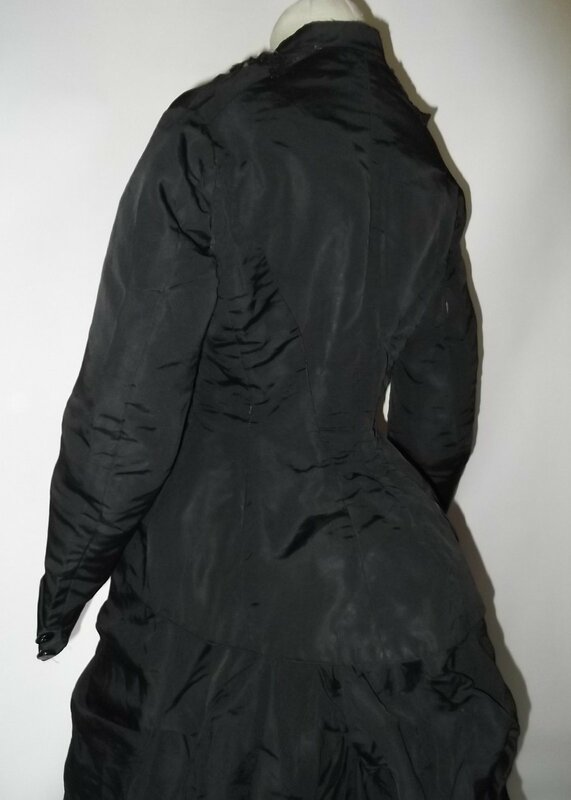 If you cannot pay, please refrain from bidding. Thank you! Please note that non-payment cases are automatically opened on 4th post auction day. International bidders are most welcome! 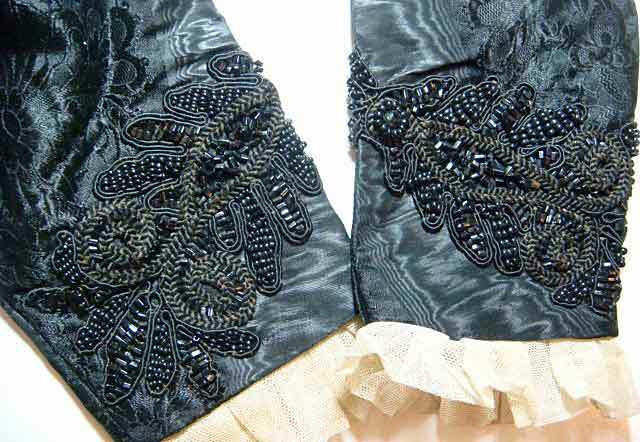 This is a pair of vintage Victorian era mourning black silk gigot leg of mutton sleeves. 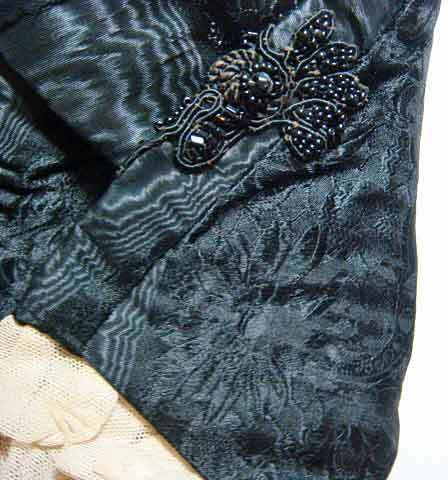 It is made of a black silk satin fabric with jet beaded trim. 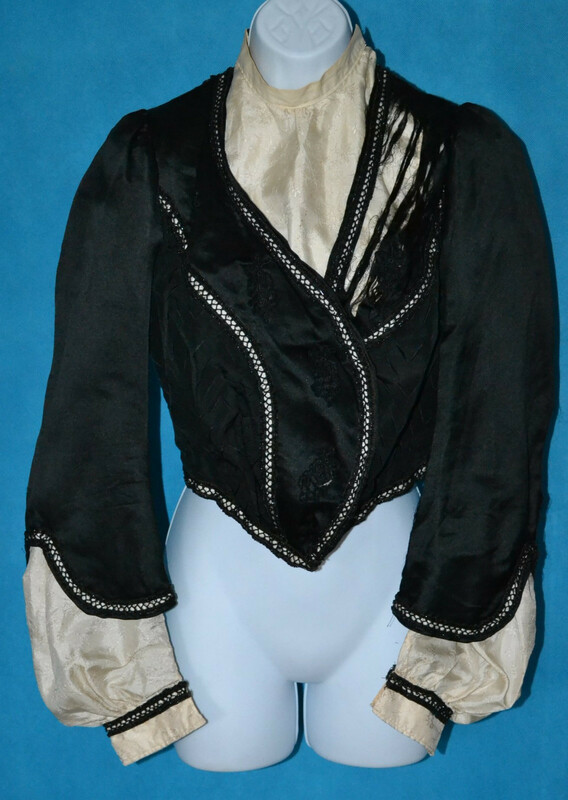 The gigot leg of mutton style sleeves have a large balloon puff top, narrow fitted cuffs & are fully lined. 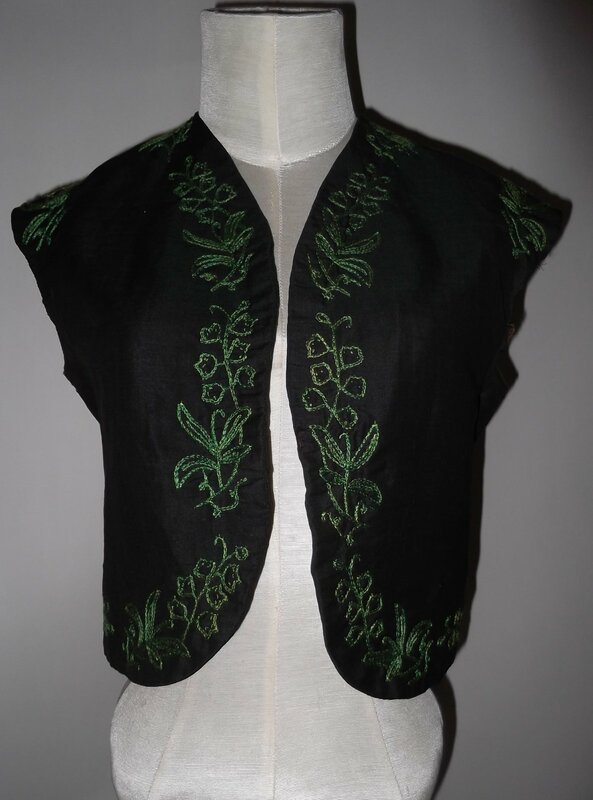 Great for Design, Study or Pattern. 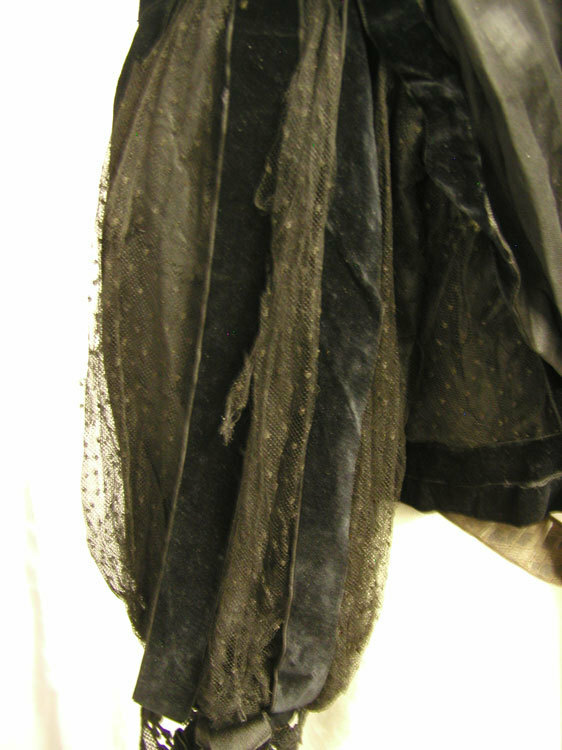 Measurements: Length 25" Arm Hole Opening 14" Cuff 6"
This bustle gown dates to the Victorian 19th C and is fashioned of a black silk faille, two piece in its construction. 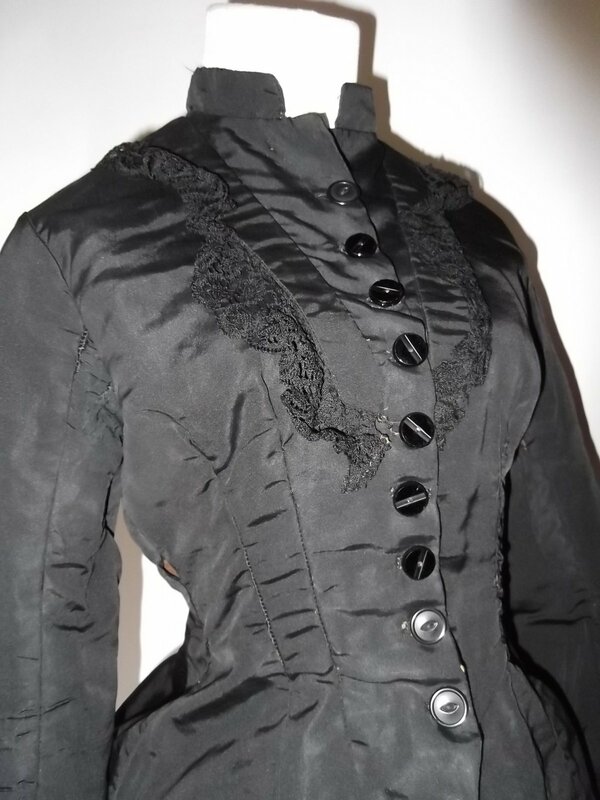 The bodice closes up the front with etched jet buttons, four are absent and have been replaced, I personally would move the buttons from the cuffs to replace. 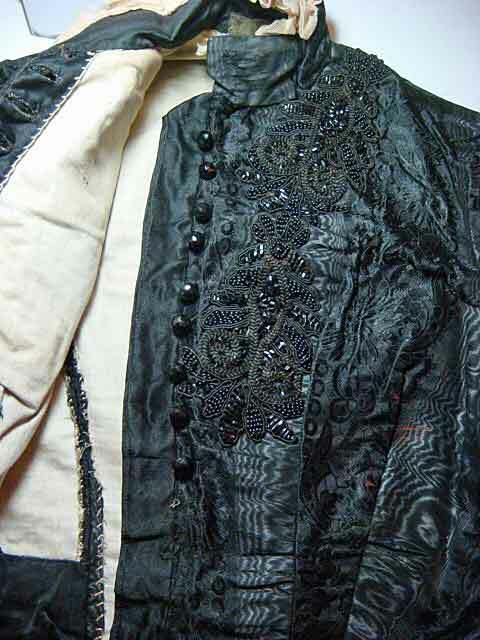 A silk cluny lace trims around the lapels, it shows weakness and I personally would remove. 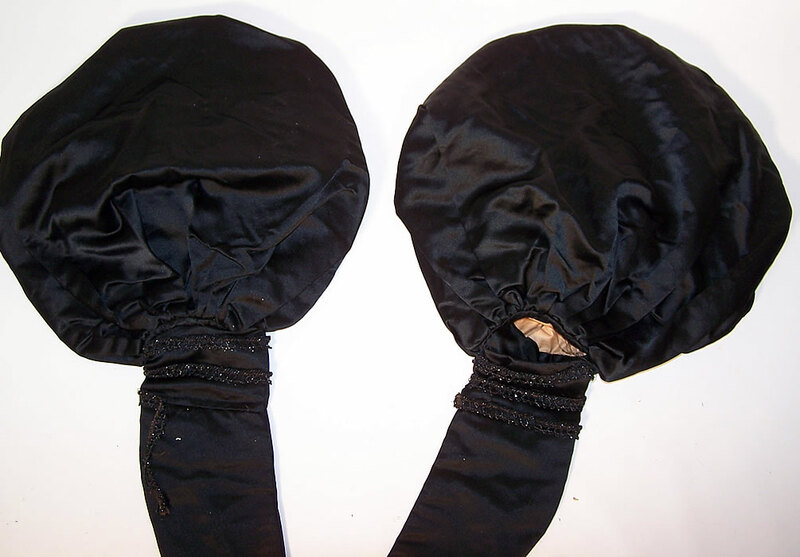 The skirting is lined in polished cotton with an inner ruched gathering with a drawstring tape. 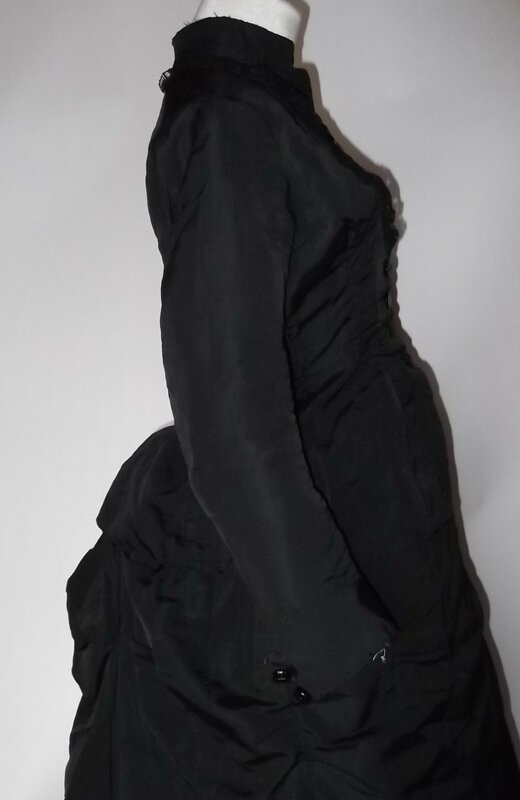 The bottom of the skirting is in heavy ruched effect running completely around with the inner skirting trimmed in box pleat ruffling that peaks out from beneath. 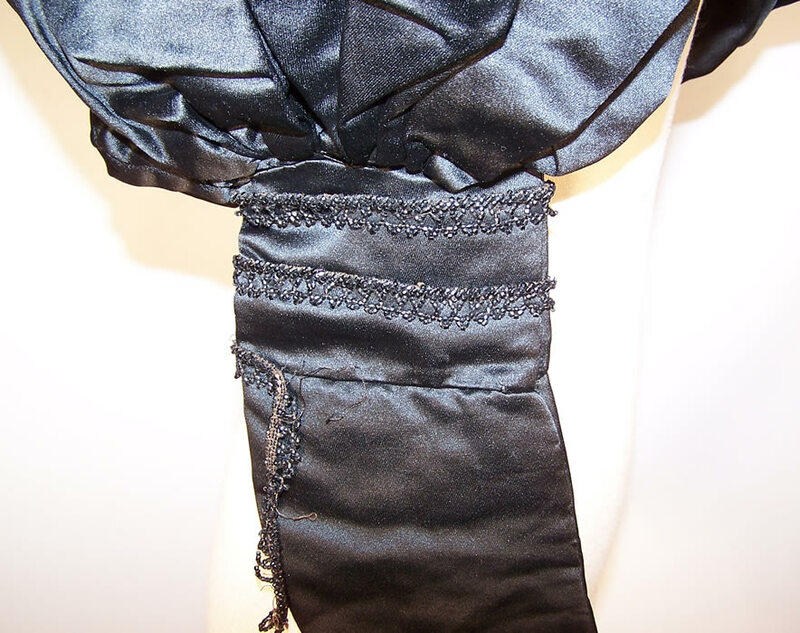 The waistband has some fray where the piece was pinned together over the years, strengthening is needed and there is a frayed area to the silk on either side of the closure following along the waistband edge, it is hidden by the bodice when worn but I would repair to strengthen. 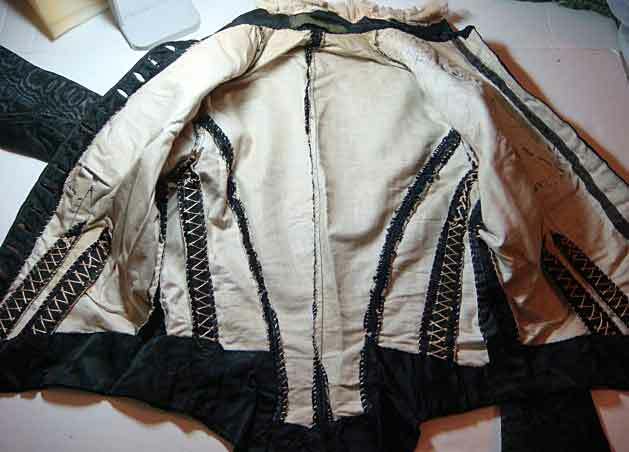 The underarms show a mild stretched wear to the silk with several pinhead holes beneath the underarms and the collar edge is splitting, a new seam is needed. 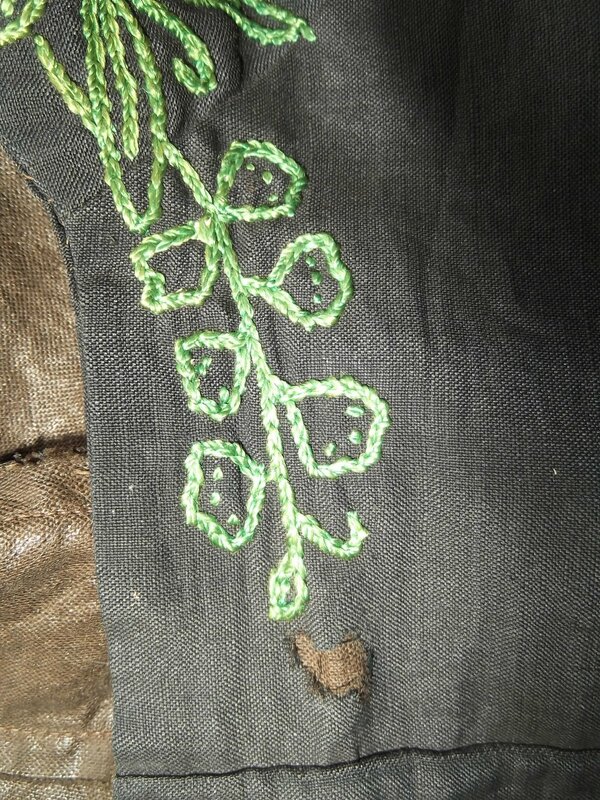 Small stretched seam wear is seen to the front seams and I personally would cover with a jet beading to fully hide. 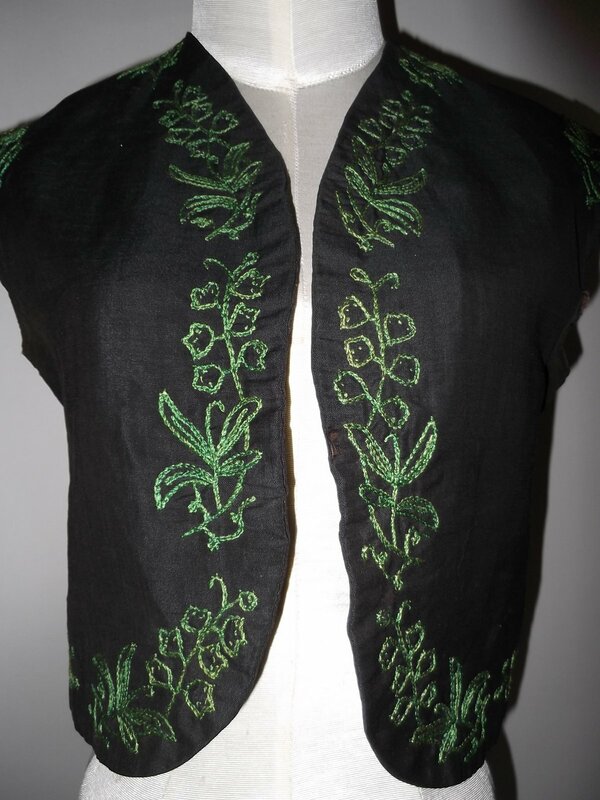 Despite the small flaws, this piece is in strong wearable condition and with added trims would be most becoming. 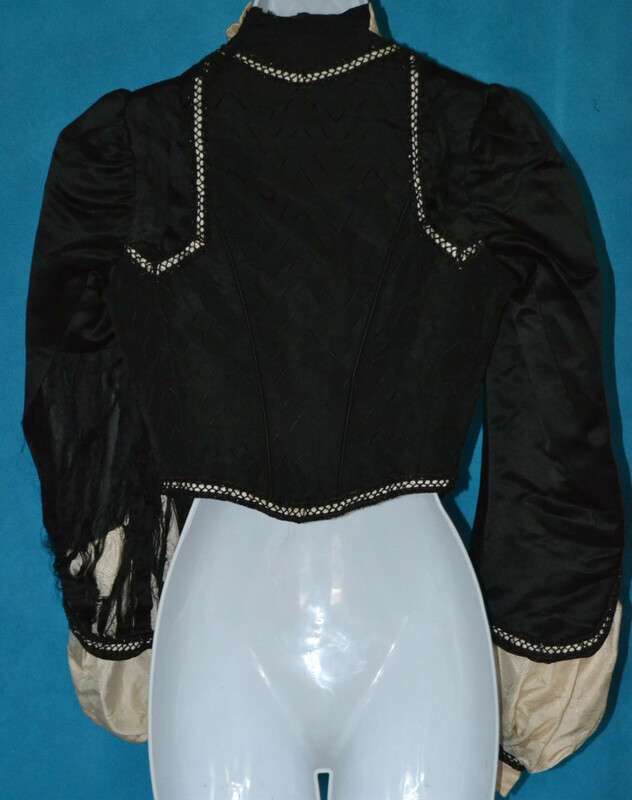 Measures 36 inches around the bust, 28 inches around the waist, and 24 inches in its length, the skirt measures 28 inches around the waist, 41 inches in length, and a bottom sweep measuring 82 inches around.